Etsy Friday! 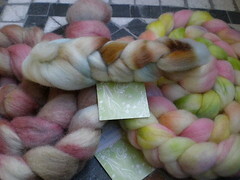 Funky Carolina rovings in Can’t Elope and Rosie Rock. Also a little twist of something extra and unknown. Gorgeous. Can’t wait to spin them up. Today’s visit to Little India was very exciting. I was minding my own business in a sari shop, knitting away and waiting for a friend to get fitted, when a little old Indian lady snatched Charade out of my hands. She began squealing, “Oh! Knitting! I know what to do!” and proceeded to start knitting merrily away. Except she’s never actually used dpns before, whipped a needle out and dropped a bunch of stitches. Fortunately it was on the st st bottom of the foot side. I politely took the sock away and fixed it. She looked like she really wanted another go at it, once I was done with the repairs. We compromised, I showed her how to use the dpns and kept my hands on the sock, she watched and didn’t get the sock back. I don’t know if everyone was happy, but my sock didn’t lose any more stitches, so that’s ok. Everyone in Little India was very interested in the sock and wanted to know if I was having a baby. For the record? No. Absolutely not. I was having samosas, masala dosas, vegetarian curries and chapati, but I am NOT having any baby. The little old Indian woman may have squealed…but I would’ve shrieked if she had done that to my sock! Yeah I don’t know if I would have been so polite if someone yanked my sock away…I got kind of huffy the other day when this Chinese lady on the bus just grabbed it to look at it. Sounds interesting, though!